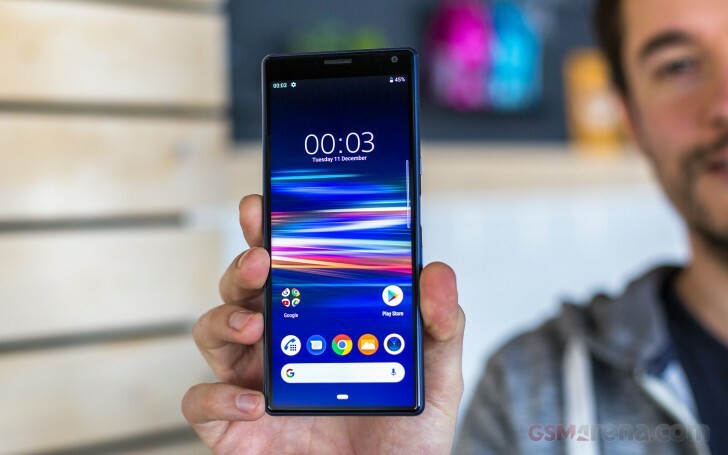 Sony's newly revamped smartphone lineup revolves around the digit 1 - there's the flagship Xperia 1 that's not quite ready for prime time and the Xperia 10 and 10 Plus in the midrange, the two very much in stores as we speak. We had a closer look at the 10 Plus recently, and now it's the smaller 10's turn. Much like the other 1s, the Xperia 10 sports a 21:9 aspect display - Sony sees this as the future of smartphones and is keen to take us there. The 10's 6-incher still has FullHD+ resolution, so it's got as many pixels as the 10 Plus, but comes with a few sacrifices compared to the larger model. Chief among those is the chipset - the Snapdragon 636 in the 10 Plus is a bit underpowered, and the Xperia 10 comes with the less exciting S630. A gig less RAM than the Plus's 4 and a depth camera on the 10's back as opposed to the Plus's telephoto shooter are a couple of the more obvious differences, but there are other ones hidden from plain sight - take out the card tray and you'll see a shared slot for the second SIM and memory card, where the Plus had dedicated slots for all three. Body: Plastic unibody with "metallic finish"; Gorilla Glass 5 on front; 155.7 x 68 x 8.4 mm; 162 grams; Black, Navy, Silver, Pink color options. Memory: 3GB/4GB (in China) of RAM + 64GB storage; up to 512GB microSD card support. The Xperia 10 does keep the selfie camera of the Plus - the segmentation only goes so far. The smaller phone also has the same unibody design as the 10 Plus, complete with the side-mounted fingerprint sensor - it's physically much the same phone, only smaller. We'll talk more about that in a minute, but let's first go over the retail package. 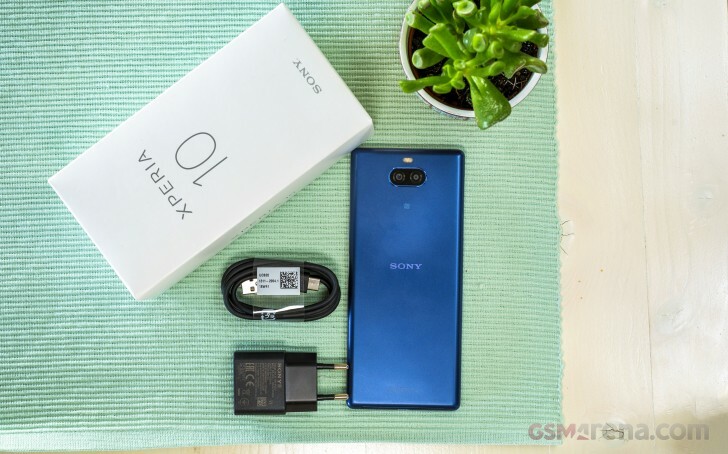 The Xperia 10 we have for review comes in a plain white box with the phone's name stamped on it in gray. While the box itself is representative of what you'll find in the store, the contents aren't necessarily so. Sony bundles vary by region and carrier so asking before buying wouldn't hurt. What we got was a plain 5V/1.5A charger and a USB-A-to-C cable to go with it. The phone is Power Delivery capable and Sony does make a PD charger, which could possibly make it to the box in some markets, though we wouldn't count on it. A bit more likely is that you'll find a set of earbuds in the box - again, not in all markets, but some will get those.